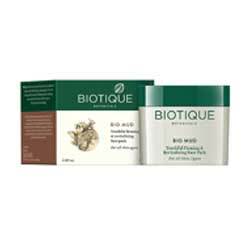 Biotique Bio Mud Pack Youthful Firming & Revitalizing Face Pack Online - Skin Tightening Pack, Skin Rejuvenation, reduce appearance of lines & wrinkles. Firming & Revitalizing Pack help to lift, tighten and reduce appearance of lines & wrinkles. Apply a thick layer on cleansed face and neck Avoid eye and mouth areas. Leave on for15-20 minutes, Rinse with water or a damp washcloth. Use daily or as needed.